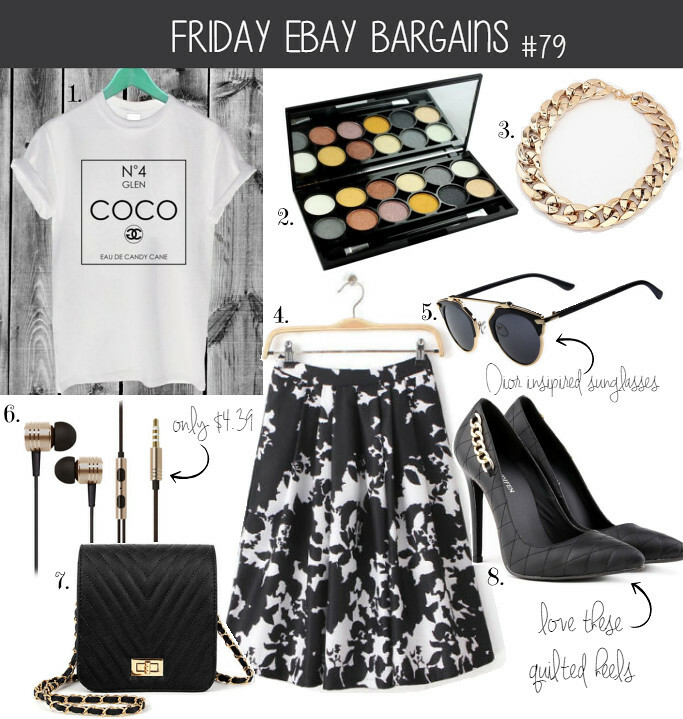 Since I was wearing a statement slogan sweater in this weeks outfit post, I decided to include a similar shirt in this weeks Ebay bargains post! I know that this whole slogan shirt thing has been popular for forever right now, but I am still loving it and I really love how people get creative and design different quirky and funny slogans! For example, this shirt is a combination of Chanel logo and the Meann Girls movie reference ( “You go Glen Coco“!) and there are plenty these kind of statement shirts on Ebay! Tā kā šīs nedēļas outfitā es biju uzvilkusi džemperi ar uzrakstu, šajā Ebay bargains rakstā es nolēmu iekļaut arī T-krekliņu ar līdzīga veida uzdruku! Es zinu, ka šāda veida t-krekli ar uzrakstiem ir populāri jau ļoti ilgu laiku, bet man šī modes tendence vēl joprojām ļoti patīk un es ar katru reizi ar vien vairāk brīnos par cilvēku izdomu- jo ļoti bieži šie uzraksti ir tiešām oriģināli un pat smieklīgi! Šis krekliņš ir zīmola Chanel logo un atsauces uz filmu “Mean Girls” ( “You go Glen Coco“) apvienojums un Ebay var atrast vēl simtiem dažādu šāda veida krekliņu, džemperu utt! lovely stuff especially top and skirt! This would be an amazing look! What a lovely post turned out, I enjoyed a lot! This technic electric eye shadows pallet is so attractive, it would be a pleasure to use it, indeed. The skirt and little purse are also so cute;) All in all, each of those items are simply adorable, nice choice, Maddie! G.J – A Personal Style, Beauty & Lifestyle blog. I love this whole set, especially those shoes!!! Love the graphic tee and floral skirt, the black and white theme is awesome and the shoes are fab, too!